Hotel Van Schaffelaar is the first real open-air hotel in the Netherlands. The hotel is a performative intervention in public space in which the active participation of the public is indispensable. The participation is what makes the performance, which begins right after the guest checks in and a host takes you to your bed. The programme takes you through the night and the morning. It includes an open-air cinema related to the theme of freedom and a wellness area with a hot tub, as well as singer-songwriters at the foot of your bed and storytellers that whisper a story into your ear before going to bed. At sunrise – as the guests slowly wake up outdoors – local residents serve breakfast. After the guests check out around eleven o’clock, the hotel is dismantled. Two hours later, there’s not a single trace of it anymore. 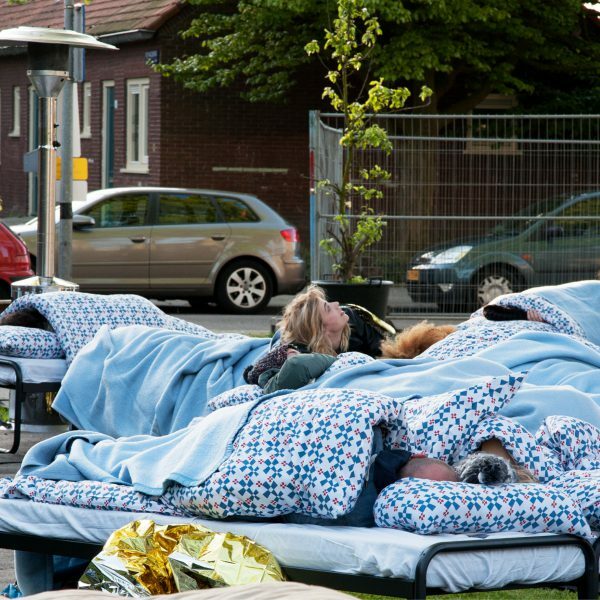 The idea for an open-air hotel came about during a collaboration between artists from Cascoland and placemakers from Urbanboost, two parties that are actively involved in a neighbourhood called Kolenkitbuurt in Amsterdam. In the context of 4 and 5 May – the commemoration of German occupation and the celebration of freedom – they wanted to make a statement. Staying at the open-air hotel is a unique sleep experience, but even more important than that are the people that the guests meet and the stories that they exchange. While many of us take our freedom for granted, that isn’t the case for people who have had to flee from unsafe areas or have family and friends abroad who still live in unsafe conditions every day. Kolenkitbuurt is one of the most multicultural neighbourhoods in Amsterdam, with a great deal of variation when it comes to background, income and education. In recent years, there has been an influx of refugees and holders of residence permits: all of these residents have their own story and experiences to tell and their own notion of safety and freedom. 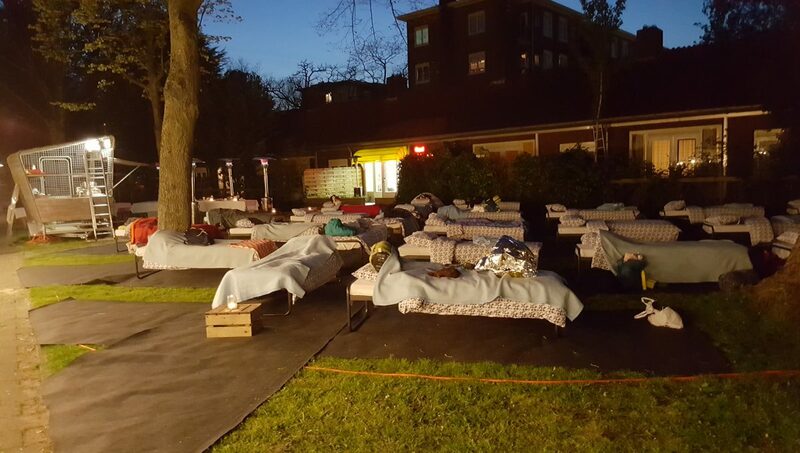 In 2015, Cascoland already had an actor sleep overnight on Jan van Schaffelaarplantsoen in Kolenkitbuurt for its promotional event ‘Hé Gast’ (‘Hey guest/dude’: ‘gast’ means both guest and dude in Dutch, ed.) to show that the alleged safety problem in the neighbourhood wasn’t so bad after all. Which was true: instead of bothering the sleeping guest, the young locals took him under their wing. Cascoland believes that ‘putting yourself in a vulnerable position’ provides more assurances of social safety in public space than if you were to design and programme it with vandalism in mind. An example of this is a glass house as a community meeting place in public space, as is cycling together in conflict areas, such as Palestine or a South African township, or sleeping in public space in the ‘worst neighbourhood in the Netherlands’. 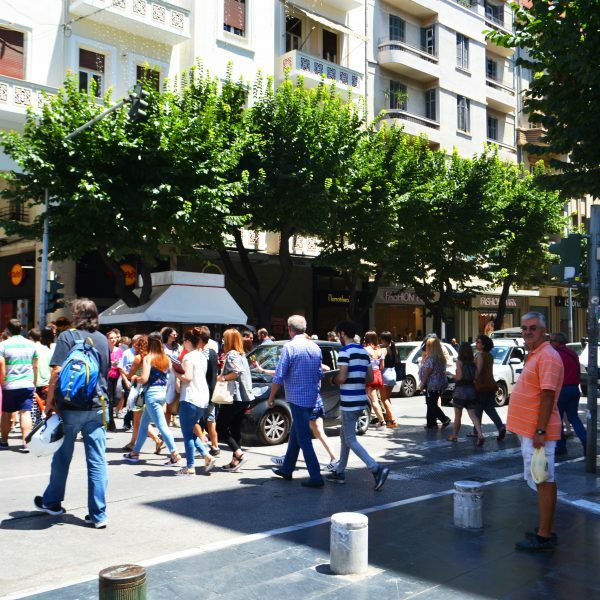 Urbanboost focuses on local communities, based on the notion that users know best what’s really needed to improve the quality of life in their environment. Previously, it organised freedom meals with the successful community initiative Boloboost – founded to give a positive boost to the deprived area of Bos en Lommer (BoLo). 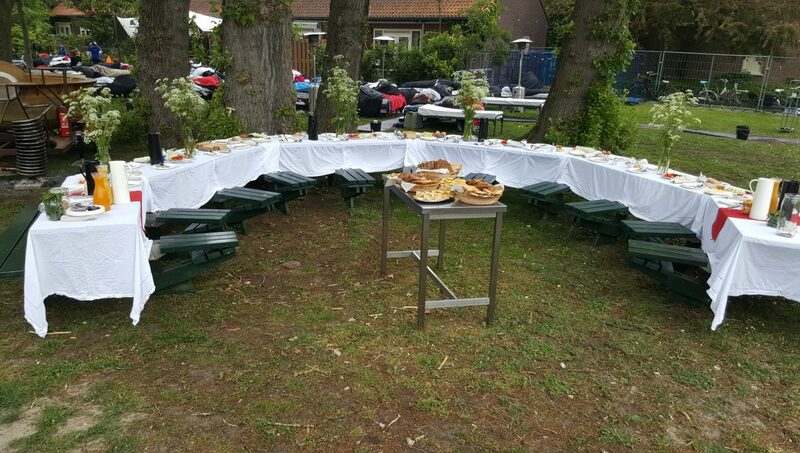 Local residents prepared meals at other residents’ houses and then served the food in a park to 250 other neighbourhood residents. Sleeping outside in public space and serving freedom meals both concern feeling safe in your own environment. These kinds of initiatives make people conscious of the fact that not everyone shares the freedom that we take for granted. Cascoland and Urbanboost wanted to spread this message to a wider audience. The idea for the open-air Hotel Van Schaffelaar came about after a bit of brainstorming (‘what if we put forty beds in public space one day and offered the guests a stay over in the open air?’). In order to ensure some commitment from guests and to keep tabs on the hotel’s occupancy, guests could book beds online with Cascoland – the latter because many people in Kolenkit are not so skilled at using the internet. Thanks to promotion via social and local media, both hotels were completely booked in no time (2016 and 2017). There were as many people interested from the neighbourhood as there were from other parts of the city. They were all curious about this unique sleeping experience. The returns from the ticket sales (€10 per bed, including breakfast), the contributions from the municipality, the sponsors and the many volunteers made it possible for the ‘one-night hotel’ to break even. Something else that needs to be taken into consideration is that when an individual wants to sleep in the open air, that’s fine. But when forty people want to sleep outside simultaneously, even if that takes place in public space, you need a license. The latter was issued without any questions asked, by the way. Another important aspect of sleeping beneath the stars is the weather. The nights can still be quite cold in early May. That’s why the guests were asked to bring appropriate warm clothing and sleeping bags. Having people sleep in the open air means that you have to have a contingency plan for when things don’t go as planned. If rain showers were forecasted, then the hotel was cancelled. If there was a small chance of rain, then there was a sheltered alternative. But there wasn’t much chance that permission would be granted for that. That’s why a licence was never requested and the location was never announced. Luckily the weather gods were in a good mood on both occasions.